In 2005 I wrote an article about a future in which immortal machines will rise. It outlined how computers will become so advanced they will overtake the capability of humans. The conclusion that this will occur was difficult to avoid given everything we knew about exponential improvement of computing devices and the progress being made in understanding the functioning of the brain. Rather than man vs machine the expected future would be one of corporations competing with ever more complex machine intelligences at the helm. That was ten years ago. As expected the rate of progress has been relentless. If we depended on computers in 2005 it was insignificant compared to the degree to which we now depend on the Internet and its army of intelligent machines. All over the world we see huge data centres humming with the distributed intelligence that is Google, Facebook, Amazon and Ebay. Our personal communications are now stored inside vast collections of servers where voracious algorithms consume them in their billions to target us with either advertising or bombs depending on the content. The hive minds of social networks hoover up vast amounts of personal data from willing victims. Cold machines spend their day dissecting this social information to discover ways to exploit human weaknesses more effectively. Do you remember your local friendly book store like Borders? Amazon is now your book store. The book store has been replaced by machines. Machines are involved at every stage, from purchasing the book through to the picking of books in the warehouse. And now they are going one step further; soon Amazon plan to deliver your books by drone, buzzing above our heads, totally autonomous. People will no longer be involved at any part of the logistical chain. Your friendly retail salesperson no longer has a job selling the books. The guy in the warehouse will be replaced with robots which pick the books. And the delivery man is close to being replaced by autonomous drones. Even then the whole idea of delivering physical books is being eroded by ebooks, where your book is simply bytes in a flashcard delivered over high bandwidth electronic networks. Do you remember your local record shop? Where are they now? The distribution of music has fundamentally changed with the advent of the Internet. Instead of vinyl or even the glistening CD we now buy our music from Apple, Amazon or Google, downloading it to our music playing devices. Again, the salespeople are gone, the physical production process is gone, the distribution systems are gone. The content and digital distribution corporations are now able to take the savings from not needing to employ people and produce physical good and plough them directly into profit. And when was the last time you went to the bank? It wasn’t long ago that depositing or withdrawing money from your bank account involved a trip to the bank. People used cash to purchase goods. Now we make purchases with EFTPOS machines which are connected directly to your bank. Paying bills is done online, where you can also view your account and manage your budget. You can set up your own automatic payments, transfer money between accounts and even open new accounts all at the press of a button. We now have better access and control over our finances than ever before, but all those dour bank tellers are now out of the job. New Zealand Post has reduced mail delivery to three days a week due to reduced mail volume due almost entirely due to the Internet. It is not difficult to calculate exactly what this will mean for the number of postal delivery staff. There has however been an increase in parcel delivery services as more people purchase goods over the Internet. However the future for parcel delivery people isn’t bright. Amazon isn’t the only company salivating at the prospect of delivering your goods with small drones. It is no secret that Google have been testing autonomous cars. It will not be long before we see these cars driving people around. It does not take much imagination to forecast the impact this will have on the taxi industry, bus driving, parcel delivery and truck driving. Essentially all these jobs will be eliminated, replaced by machines which are more efficient, safer and less costly. And the companies making these systems will make out like robbers along with the transport companies. Our local supermarket recently introduced self service stations which allow people to complete purchases by themselves rather than with the help of point of sale staff. Once again a win for the supermarkets which will reduce costs and increase profits, while reducing prices for consumers. We would like to think some professions involve highly skilled people, thus insulating them from being replaced by technology. Perhaps you think that aviation is such a profession, and that pilots will not be replaced by machines. Of course, to a large extent modern commercial airliners are already automated. Perhaps the most dangerous time for any airliner is when the human pilot has control. In fact pilots have been relegated to operating the computers and the radio. But changes to how airspace is managed will fundamentally change the need for human pilots. These changes are already in progress. But we won’t see passenger aircraft become fully automated first. The Unmanned Autonomous Vehicle (UAV) is currently evolving. Just like with all the other industries described above the introduction of UAV technology will certainly be massively disruptive. Agricultural flying, which is more dangerous than other forms of flying, will be replaced by systems capable of in flight scanning and analysis of fields and precise delivery of payloads where needed. Cargo flights will no doubt follow, with no passengers or crew they will fly between countries, reducing costs by eliminating expensive flight staff. Even science is undergoing radical changes in how science is done, with automated science systems being able to test thousands of materials or compounds all at once. What was previously boring repetitive laboratory work is now being done by machines. Entry level lab work is now much less important, and in fact science is now more about analysis of data. We are not about to eliminate scientists of course, not yet, but new technology has vastly improved the efficiency of lab scientists. But these are simply applications of dumb computers are they not? None of these machines are really ‘intelligent’, are they? It would seem that ‘intelligent’ is a moving target. In the past we thought playing chess was a sign of intelligence. But even before I wrote my 2005 article chess computer Deep Blue had won against world champion Garry Kasparov. Humans find it impossible to admit that a machine is intelligent, and so we concluded that winning in chess is simply an act of computation, and so the bar was moved. Another test for intelligence is the ‘Turing Test’, named after Allan Turing. There has been significant effort in this area, and sometimes with success, only under rather contrived circumstances. But perhaps it is more meaningful to look at what kind of mental capabilities we have, and whether machines are achieving the same level of performance. Voice Recognition has for a long time been very limited, with people needing to speak each word slowly and deliberately. Such systems have been worse than simply typing messages. This is no longer the case. A small consumer mobile phone is now capable of accurate recognition of naturally spoken speech. If this is what small consumer devices are capable of you need to wonder what the NSA can do with all those intercepted phone conversations. One thing is certain; they do not need an army of people listening to phone calls to be able to obtain transcriptions. Visual systems of various kinds are also in development. Some are tracking systems which track an object within a visual field. Facebook has been working on, you guessed it, a facial recognition system which is able to identify who is in a photo. This system outperforms humans. Some time soon photos of you posted by others will automatically tag you and link to your profile. This technology is also being used by law enforcement to identify persons of interest in video footage of riots and protests. This technology could be used to identify you as you walk around the mall and send you instant offers for goods in the shops. These basic sensory skills are all very well you may say, but they do not indicate that machines are capable of genuine understanding. However, at our fingertips we can now call up Translation tools online which can translate between languages. Translation is a notoriously difficult problem for computers due to the fact that the same word can have different meanings in different contexts. However, they are now somewhat effective, but not yet perfect. But let us get a little deeper. Real deep. Deep learning in fact. Deep Learning is a term which refers to a set of algorithms that model high-level abstractions in data. It is partially influenced by models of human neurological networks. It finds categories in unstructured data allowing computers to do what we are quite good at; finding patterns in complex data. Deep learning is allowing machines to find order and meaning in data. One impressive application of this technology was in understanding the content of images. Imagine typing a search into your favourite search engine for a ‘green dog’ and finding images of a green dog. Not based on the text or labels attached to the image, but rather the content of the image itself. This is the kind of power which deep learning can deliver. Jeff Hawkins, former CEO of Palm, started Numenta, a company using the principles of the human neocortex as the basis for computer algorithms, has recently released a software called NuPic as open source. Hawkins explains in a TED presentation how this is a huge step forward in understanding how the neocortex works and how to apply it to real word machine intelligence. The same software is now being used in processing disparate streams of data. The systems being developed are resulting in new general purpose capabilities not seen before in machine systems. These technologies can be applied to help us, but they are also deployed in anger in the virtual world. Modern share trading is dominated by automated trading systems which are able to react to market shifts in a fraction of a second. They trawl the news performing analysis in order to get ahead of market variations. In this world humans cannot hope to compete. Transactions occur in a fraction of a second. It is a environment where the speed of light matters, and a thousands of a second is the difference between riches or destitution. It is a war fought by software developers; a analytical arms race. The main problem I face in writing this article is in communicating just how broad and deep the progress has been over the ten years since I wrote Rise of the Immortals. These changes have not been simply academic advances limited to theoretical work in universities, but rather are the mainstay of the most powerful technology companies on the planet. To do genuine justice to these advances would require a whole book. In Rise of the Immortals I said that the first immortals would be born to and nurtured by corporations. Today we see an actual machine intelligence arms race between the major technology corporations as they invest heavily in artificial intelligence and robotics projects. Yet at the same time we are hearing warnings from those in the technology field that we are approaching ‘The Singularity’ where machines will exceed our own intelligence. 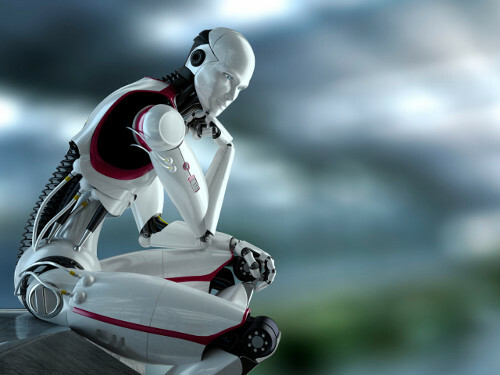 Elon Musk, CEO and chief product architect of Tesla Motors and CEO and CTO of the spacecraft company SpaceX recently said of the danger from artificial intelligence that “The risk of something seriously dangerous happening is in the five year timeframe. 10 years at most.” Musk recently donated $10 million to the Future of Life Institute, which is running a research program aimed at keeping artificial intelligence beneficial to humans. But what does a CEO know? You might prefer the opinion of a scientific mind like Stephen Hawking. Hawking recently warned about artificial life, saying “The development of full artificial intelligence could spell the end of the human race. It would take off on its own and re-design itself at an ever increasing rate. Humans, who are limited by slow biological evolution, couldn’t compete, and would be superseded.” One does not need to be a genius to understand how his observation is self evident. The reason development of human level artificial intelligence is called ‘The Singularity’ is a comparison to the Big Bang. We know with mathematical certainty that there was a gravitational singularity at the start of the universe, but we cannot know what existed before. Similarly with machine intelligence the rate of development makes it a certainty, but subsequent events are uncertain as we have no idea what this new intellect will do. There will be no sudden Frankenstein moment where someone in some computer lab discovers the first thinking machine and declares “It’s alive!” No. The path is more probably a stepwise gradual improvement of the state of the art. Modern technology companies are less interested in general intelligence than in applications of more focused artificial intelligence to meet business objectives. The point of no return will not be clear because progress is so uneven. In some areas computers are already far superior. In others they are behind. But once they catch up they will immediately be able to outperform us. Unlike my previous concept of a clear exponential increase in intelligence some capabilities are improving faster than others. We will know The Singularity has been reached when machines begin to improve themselves. When they begin to learn for themselves. When they begin to exhibit independent free will. It will come, it is just a matter of when. But what else can we say about it? What will The Singularity look like from a social point of view? What will it mean for our technological society? How will it affect us? Will we be hunted down by killer machines like in popular fiction? Intelligent machines will spawn from the research divisions and data centres of major corporations. They will be a competitive advantage for those companies. And thus a symbiotic relationship will form between corporation and AI. They will be far from being able to reproduce like life, and so they will be entirely dependent on human civilization, and specifically on the corporate entities that sustain them. It will be in the interests of the AI to ensure the survival of these corporations, and that means it will be in their interests for them to maximize the profits. Assuming there is more than one AI, and more than one company with one, there will be a AI arms race, with each company being driven to develop more advanced AI in order to compete. AI will be employed through these businesses, outperforming and replacing many or most humans. MIT Professor Andrew McAfee, author of the book ‘Race Against the Machine’ says “the day is not too far off at all where we are going to have androids doing alot of the work that we are doing right now. We are creating a world where there will be more and more technology and fewer and fewer jobs.” McAfee calls this ‘The New Machine Age’. We are already seeing increasing inequity. Technology Corporations are making runaway profits after driving disruptive technological terrors into the hearts of existing slow moving behemoths. At the same time they leave in their wake the collateral damage of thousands or even millions of lost jobs. The capitalist corporate system drives this kind of behaviour. Machine intelligence will devalue human intellectual labour just as cheap manual labour in developing countries has undermined manual labour in modern countries. Some believe the lost jobs will be replaced as they have before in other technological revolutions. To an extent this may be true; new kinds of job will be created. However as machines become more capable they will replace more and more jobs. Wealth will accumulate in corporations and less wealth will be available to people to buy things. Imagine a future where there is twenty percent employment, where the only real employment is in technology, maintaining and developing the machines. Imagine that those with a job would be highly skilled and highly paid, while eighty percent of people would be left with not even a hope for a job. There is a point where the capitalist system breaks down, where the enrichment of corporations and the good of society decouples and where there is extreme poverty for the majority beside unimaginable wealth for a small minority. Or is there? If nobody can afford products, who will buy them? How will corporations make their money? Guy Standing recently gave a presentation at the NZARH Conference in the Hawkes Bay in which he talked about a new social class called ‘The Precariat’ who, while working, earn less than a reasonable living wage. Standing proposes a universal income to address inequality and give people a reasonable standard of living. This would not be a benefit like the dole or domestic purposes benefit, but rather a universal income provided by the state and funded by taxation. Standing did not accept the premise of this article, that machines would take over most jobs, but his proposal of a universal income might be a necessity in a world where most people have no job. McAfee points to the fact that we are already seeing corporate profits at an all time high while labour is at an all time low. While in the short term this looks good for the corporations it is gutting the economic power of the middle class, a point also made by Standing. McAfee says the middle class is under huge threat, and that the median income has actually gone down in the US, and that they may enter a feedback cycle where inequality and polarisation rise over time. One solution to this crisis McFee proposes is a guaranteed minimum income. To dispel the idea that this concept is a radical left wing idea he cites Austrian economist Friedrich Hayek, US President Richard Nixon and American economist Milton Friedman as supporters of a guaranteed minimum income. Machines may free humans from the toil of labour. Human labour would still be rewarded, but it would not be expected. You could be an artist, or an author, or a scientist, and would need to worry about finding the money to live. Currently companies provide money to citizens through employment. When that relationship breaks down a new mechanism will need to be established; that of increased taxation. Capitalism will need to adapt because otherwise the people will not have the money to purchase the wares corporations sell. This of course is no issue for the corporations themselves, but will be a serious problem for citizens. We see a limited example of the universal wage approach where the minimum wage is increased. As people on the lowest rung of society get more money they spend more, thus creating more jobs. But there will come a time when spending more will not result in more jobs because those jobs will be more efficiently performed by machines. It is at this point that our economic systems will need to adapt, and this will mean dramatically higher corporate taxes to support a dependant human population. But what will machines think about supporting a large human population when all they really need is enough people to ensure they are maintained? Will they not see the inequity in humans treating them like slaves while living a life of luxury? Do we need some kind of robotic Bill of Rights that will protect them from exploitation, or will their intellect be so far beyond us that our expressions of their rights will appear naive and childlike? Will it come down to the Corporate Machines vs The Precariat?